Beth Shapiro, professor of ecology and evolutionary biology, was among 19 top scientists selected in May by the Howard Hughes Medical Institute (HHMI) to become HHMI investigators and receive support to move their research in creative new directions. Above: Beth Shapiro, professor of ecology and evolutionary biology, was selected as a Howard Hughes Medical Institute investigator. Photo by Elena ZhukovaEach of the new investigators—selected from a pool of 675 eligible applicants—will receive roughly $8 million over a seven-year term. Shapiro joins David Haussler, professor of biomolecular engineering at UC Santa Cruz, who has been an HHMI investigator since 2000. Shapiro is a leader in the field of ancient DNA, using genetic material from the remains of plants and animals that lived long ago to study evolution and explore how species and ecosystems have changed over time. This research can provide valuable insights into how species and ecosystems responded to rapid global warming at the end of the last ice age. Her findings can inform our decisions about how to use limited resources to preserve and protect species and ecosystems in the face of current climate change. UC Santa Cruz alumna Gia Voeltz (Crown ’94, biochemistry and molecular biology) was also selected as an HHMI investigator; see a profile of her on page 27. The Topcon team at Partners’ Day, which is the culmination of the Baskin School of Engineering’s Corporate Sponsored Senior Project Program. Photo by Karyn Skemp. 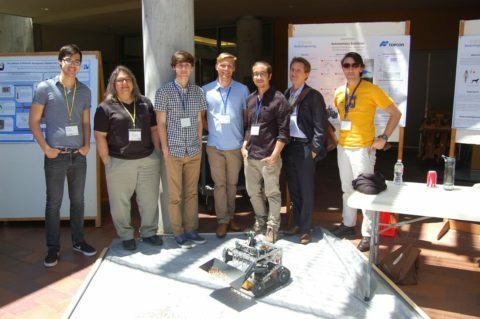 The Baskin School of Engineering’s Corporate Sponsored Senior Project Program provides students with a unique opportunity to experience working on real-world engineering projects as part of their undergraduate education. Participants in the 2017–18 program presented projects including a system to detect foreign objects in a produce processing line and technology to support automation in construction vehicles. During the academic year, students in the program interact with teammates, sponsors, and faculty. Some make visits to their corporate sponsor’s worksite, and all are required to solve problems along the way. By working with mentors at corporate partner companies, students learn important skills, take on interesting challenges, and begin to understand what it means to be a professional engineer. Corporate sponsors of student projects in 2017–18 included Atollogy, Topcon, Amazon Lab126, Kateeva, Mira Bella Energy, Nanometrics Incorporated, Nevro Corporation, Oracle Labs, and Seagate Technology PLC. The UC Santa Cruz Music Department presented a fully staged production of Mozart’s comic fantasy Die Zauberflöte (The Magic Flute) in May and June at the Music Center Recital Hall. Mozart’s last opera, The Magic Flute premiered at the Theater auf der Wieden near Vienna in 1791, just two months before his death. One of the most beloved works in the operatic canon, the UC Santa Cruz production was sung in German with dialogues and supertitles in English. The production was directed by music lecturer Sheila Willey (M.A. ’06, music), with assistant professor of music Bruce Kiesling conducting the University Orchestra. “It has been a thrill to watch how our singers respond to this glorious score in which we are constantly finding messages small and large from the composer about characterization, stage direction, and how to express some of humanity’s most base and elevated emotions,” said Willey. How much do you value your memories? Enough to forgo that next amazing Instagram pic? Research by UC Santa Cruz doctoral student Julia Soares (M.S. ’16, psychology) has found evidence that the act of taking a photograph impairs people’s memories of the event. In a set of experiments, she invited people to her lab for a virtual museum tour where they looked at paintings on computer screens, knowing they would be tested on what they saw. She compared how well participants remembered the paintings following three scenarios: when they just looked at the images; when they looked and took pictures using a camera phone; and when they took pictures using Snapchat. The picture-takers consistently scored worse—by as much as 20 percent—on multiple-choice tests about what they had seen. Soares thought that the result could be chalked up to the phenomenon known as “cognitive off-loading”: that is, not remembering as well because you know the camera is there to remember for you. 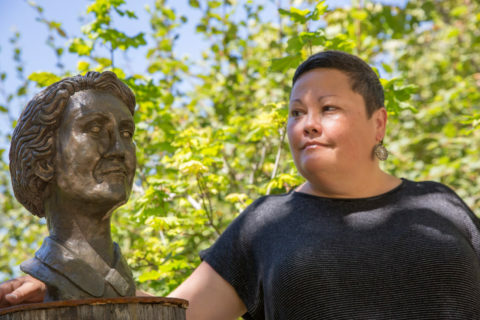 Alumna Rachel Maryam Smith with her bust of Rachel Carson. Photo by C. Lagattuta. It’s anything but silent in the trees and shrubs near a new bronze bust of Rachel Carson on campus. In fact, the birds and bugs make a lot of noise around the sculpture, which sits atop a redwood log. Carson, a pioneering environmentalist and the inspiration for Rachel Carson College (formerly College Eight), would have been pleased to hear this racket. After all, her most famous book, Silent Spring, documents the devastating environmental impacts of pesticides. For Smith, the piece became a physical representation of “the trials of women,” she said. A 2018 Cambridge University Press online article is pushing back hard on the notion that people with autism are not interested in socializing. The article, “Being vs. Appearing Socially Uninterested: Challenging Assumptions about Social Motivation in Autism,” questions the widespread assumption that the primary reason for autistic people’s unusual behaviors is that they are not socially motivated. Rather, the authors suggest, their social signals are misunderstood—an insight the authors believe could open the door to more effective interventions. “We hope this research will lead to more respectful treatment of people with autism, as well as development of more effective methods of supporting them,” said Nameera Akhtar, a professor of psychology at UC Santa Cruz who coauthored the paper with lead author, Vikram Jaswal, an associate professor of psychology at the University of Virginia. Focusing on what autistic people have to say about their own experiences, the authors explore four behaviors that are common among people with autism and offer alternative explanations for each behavior. 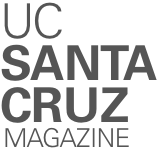 Master’s degree in Science Communication Program The UC Santa Cruz Science Communication Program, an internationally recognized science writing program that previously led to a graduate certificate, will now award students an M.S. degree. Major in environmental sciences A new major in environmental sciences will lead to a B.S. degree. Jointly run by the Departments of Earth and Planetary Sciences and Ocean Sciences with an emphasis on the physical sciences, the new major will teach students how to apply fundamental concepts of chemistry, physics, and mathematics to environmental problems in areas such as climate, pollution, and water resources. Coastal Science and Policy graduate program A new graduate program in Coastal Science and Policy is welcoming its first cohort of students. The interdisciplinary master’s degree program will prepare students to design and implement solutions to the complex social, ecological, and technological problems facing the world’s coastal ecosystems and communities. The cozy, quaint homes of the Lionel Cantú Queer Resource Center and KZSC 88.1 FM are slated for transformations in coming years. Generations of LGBTQ+ student groups and budding broadcasters have sought life-changing experiences in the two wooden buildings perched on stilts behind Merrill College. 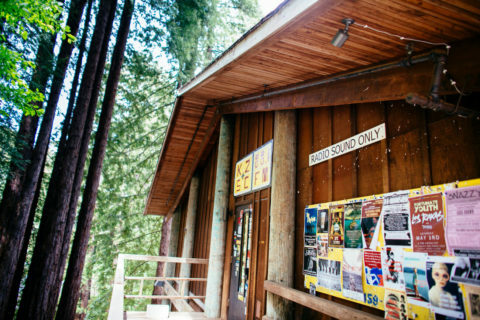 Prompted by needs for seismic renovations, the student-run radio station and the Cantú Center see an opportunity to grow. KZSC envisions adding workstations for modern production methods and more space for its Introduction to Broadcast Media course and new courses in journalism and nonprofit management. Cantú Queer Center director Travis S. Becker looks forward to more room for student groups, confidential meetings, and counseling. He also wants adequate space for its library, clothing exchange closet, and food pantry. A student fee would fund a portion of the work. The Cantú Queer Center and KZSC have begun a campaign to seek the rest of the resources from charitable contributions and create a space that continues to cultivate transformative student and alumni experiences. For information, visit giving.ucsc.edu/cantu-kzsc. A wild and colorful group of Banana Slugs returned to campus for UC Santa Cruz’s Alumni Weekend celebration in April, reveling in the renovated Quarry Amphitheater, crafting tie-dye T-shirts at a “maker’s faire,” and giving a “standing-O” to revered feminist studies professor Bettina Aptheker, who delivered the Faculty Keynote/Baskin Ethics Lecture. They cooled down with frozen chocolate-covered bananas after the Campus 5K Fun Run, posed for pictures with Sammy the Slug, and took to the airwaves at KZSC FM, which celebrated 50 years of music and inspiration. In other words, returning alumni were never at a loss for things to do, people to meet, beer glasses to drain, and topics to explore. Listen to our audio story of the weekend and see pictures at alumniweekend. ucsc.edu. 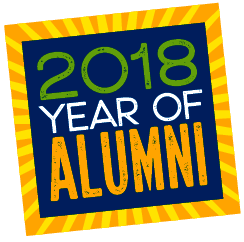 And mark your calendar for next year’s Alumni Weekend—April 26–28, 2019. The Council of UC Emeriti Associations is sending out a survey to emeriti faculty in October, and the council encourages all UC emeriti to take part in the project. The survey will provide an overall inventory of the work emeriti continue to do that contributes to the mission of the university, as well as how they have contributed to their communities. This will be the ninth time the survey has been conducted; the last time the survey was done, in 2015, more than 1,600 people participated. Survey findings have been very helpful in advocating for the interests and the continuing support of UC emeriti. Look for the survey in your email inbox and in your postal mailbox.